Little Miss is in her first big girl swim class. Even though she isn't officially 3 yet, they moved her up because she was doing so well in the younger class. It's good that I don't have to go in the water, but sad that she doesn't need her Mommy to go with her. My camera kept fogging up when I first started taking pictures because of the change in temperature. I actually like the effect it had on the first picture. She smiles the entire time she is swimming; I'm happy both my kids love the water. It makes summers much more pleasant! E still struggles with his endurance when swimming on his stomach, but he's a pro with the backstroke. He swims on the opposite side of the pool from Little Miss. I waited until the last 5 minutes of his class to just snap a couple of pictures in an attempt to prevent distracting him. Of course within 5 seconds of my arrival, he began "performing". 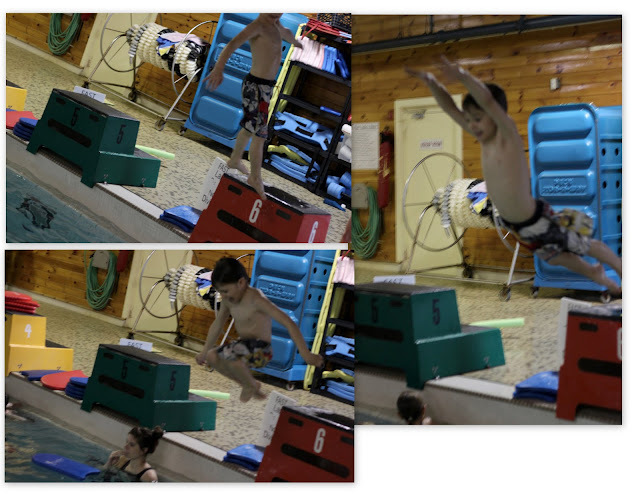 He is supposed to jump straight off the block...no spins, belly flops, etc...As you can see, he didn't conform...but now why would he?? He never does; he prefers to make up his own rules. I suppose that will come in handy some day...maybe? I will end this post with my favorite quote of the day. When eating at Panera this afternoon, Little Miss leaned her head into my shoulder and said "Mommy, you're my best friend." My melting heart!